Emotional it was, but at no point did I ever feel the film would disappear into a sea of sentimentality. Having been greatly impressed by recent works such as A Separation and About Elly, I was curious to learn what other hidden gems I could uncover from Iranian cinema. After a little digging, I found Children of Heaven and I can say hand on heart that I found it to be one of the most charming and satisfying pieces of cinema I have ever had the privilege to view. Released around 1998, director/writer Majid Majidi’s film has the simplest plot imaginable. Eight year old Ali (Amir Farrokh Hashemian) is tasked by his sick mother to go grocery shopping and take his younger sister, Zarah’s (Bahare Seddiqi) only pair of shoes to the cobbler for repair. Ali leaves the repaired shoes outside of the shop, as is the custom, and whilst inside a blind peddler inadvertently mistakes the shoes for cast offs, throws them into his barrow and takes off. For the majority of families in the west, the loss of a pair of old shoes would be no hardship, but in Ali and Zahra’s world there is zero spare cash to buy a pair of replacement shoes. Theirs is a family living on the breadline, existing literally hand to mouth. The Mother is too ill to even consider taking in washing, while Father makes his living serving tea at the local factory. Food is purchased only with the goodwill and credit facility of the local shopkeeper, and to cap it all, the family are 6 months behind with the rent. The siblings’ answer to their loss is to formulate a plan. Zahra rather begrudgingly agrees to share Ali’s pair of tattered old sneakers. Zahra will wear them for school in the mornings and after school run home as fast as her legs can carry her when she passes them onto Ali who takes his class in the afternoons. As is the case with most plans of mice and men, and in particular young children they are likely to go awry. In itself, the loss of a single pair of girl’s shoes would not be enough to interest and engage an audience for 90 minutes. This is where the genius of Majid Majidi’s storytelling comes into play. By placing the children in a home that is no stranger to poverty, Majid creates the conditions where in the mind of the children the loss of a single pair of shoes signifies nothing short of a disaster. By working the elements of the film against each other, Majid manages to create enough tension to keep the audience on Beta blockers for a week. Majid cannot be praised highly enough for painting an insignificant event and turning it into a work of cinematic beauty. What’s more, it’s a director of rare quality who is able to tease the quality of performance out of such young actors, who’s range would put many a top Hollywood actor to shame. Some of the expressions on their tiny faces are almost telepathic. It’s the children’s’ faces that speak to us so eloquently, and through their gestures we instinctively understand how the children are feeling and what they are trying to communicate. 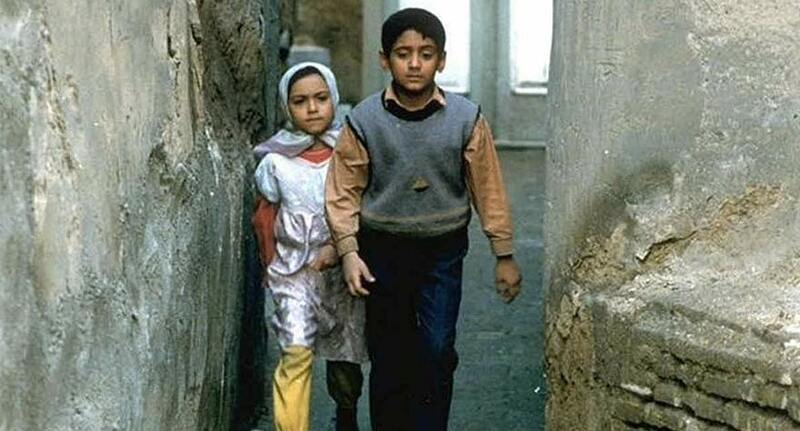 Children of Heaven was Iran’s first ever film to be nominated for an Academy Award for Best Foreign Language Film. The film lost out that year to Italy’s Life Is Beautiful, and ordinarily I would never consider reviewing a film some 15 years after it’s release. But such is the wide ranging appeal of Majid Majidi’s film, and the fact that it is so utterly charming it deserves to be watched by the new generation of film goers, and anyone who missed it first time around. I, for one, cannot ever remember being blown away so completely by a film. I was engaged and emotionally involved within minutes of seeing those big brown sobbing eyes of Ali and Zahra. Emotional it was, but at no point did I ever feel the film would disappear into a sea of sentimentality. On the contrary, Majid is far too skilful a director to use such a cheap trick. Of course we recognise the difficulty of the children’s conundrum, but it’s not sentimentality that draws us to their plight, but tremendous acting and magnificent storytelling. Through Children of Heaven, Majid Majidi has shown us that filmmakers shouldn’t necessarily need huge budgets, convoluted plots, exotic locations and A-listers to make a great film. What is required to make a great film (And Children of Heaven is a great film) is a simple plot, and a genius of a director who knows exactly what he wants and knows exactly how to get it.